Curry laksa (in many places referred to simply as "laksa") is a coconut-based curry soup. 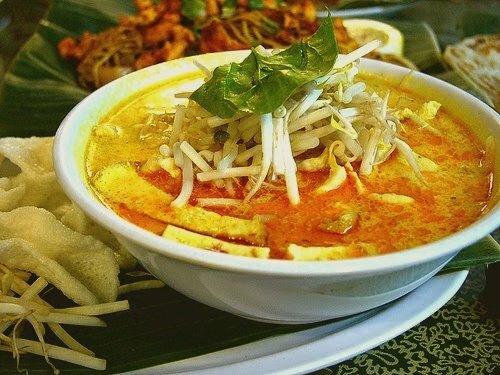 The main ingredients for most versions of curry laksa include tofu puffs, fish sticks, shrimp and cockles. Some vendors may sell chicken laksa which uses chicken instead of shrimp. Cockles are usually very commonly used in laksa and most vendors would add them into laksa unless customers request not to have cockles for hygiene reasons. Laksa is commonly served with a spoonful of sambal chilli paste and is traditionally garnished with Vietnamese coriander, or laksa leaf, which is known in Malay as daun kesum. Heat oil and fry ingredients (A) until fragrant. Add ingredients (B) and fry for 1 to 2 minutes. Add water and taupok and simmer gently for 10 minutes. Stir in milk and cook over low heat for another 5 minutes. Pour gravy over laksa noodles and serve with beansprouts, shredded chicken and fish cake. Add daun kesum and cucumber as desired. Soak dried prawns for at least 15 minutes and rinse to remove some of the salt. To prevent milk and yoghurt from curdling, bring to boil over low heat. I assume you need coconut milk, rather than cow’s milk, otherwise there is no coconut ?? ?